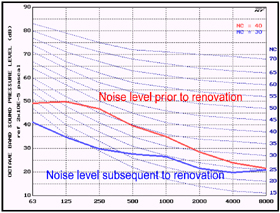 The Noise Criteria chart to the right illustrates a project where we encountered high noise levels generated by the HVAC system in a house of worship. Working with the air-conditioning contractor, we were able to effect a significant reduction in mechanical noise within the sanctuary area. An immediate improvement was achieved, both in speech intelligibility and reduced listener fatigue.